It was not for Dr Warren’s fashion choices that Bostonians congregated in the Old South Meeting House that day, nor was it the 300 soldiers present and the threat of arrest for attending that drew them there. Instead they had gathered to commemorate a bloody event that had occurred five years prior; the Boston Massacre, in which British soldiers had fired upon a mob of American colonists, killing five and wounding a further six. 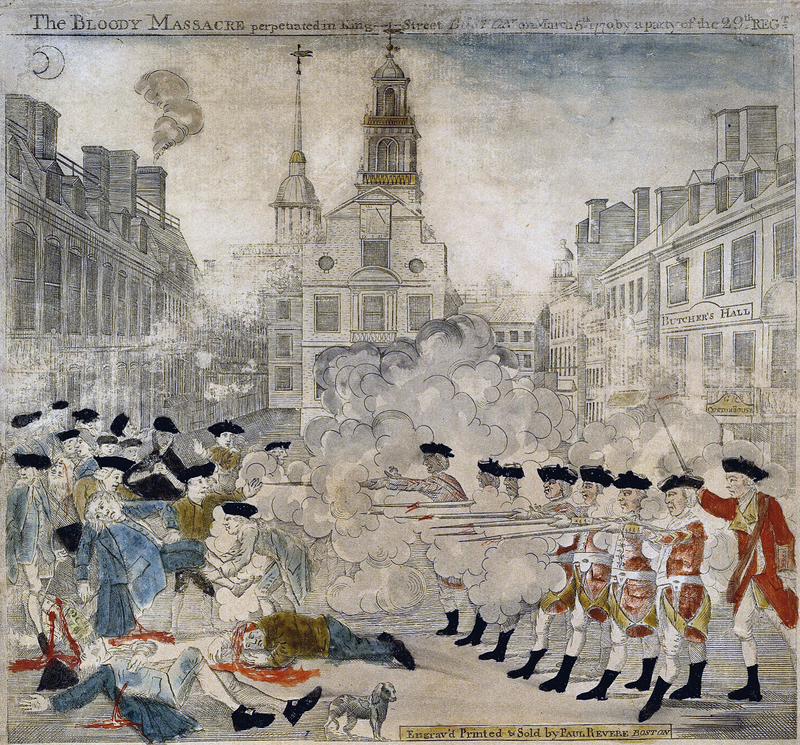 An engraving of the 1770 Boston Massacre by Paul Revere. Each year afterwards Bostonians designated a speaker to deliver an oration to commemorate the event and keep the spirit of resistance to British rule alive. In 1775 that speaker was Warren. He is recorded to have entered an apothecary opposite the Old South Meeting House, accompanied by a servant carrying a bundle of cloth, and emerged in a Roman-style toga – the symbol of the citizen Roman male – over his more customary breeches. He then proceeded to cross the street, enter the crowded meeting house, and deliver his oration. Warren’s transformation into Warren togatus was not an isolated example of appeal to ancient authority in the rhetoric of the revolutionary era. From writing under classical pseudonyms, to performing classical plays, and designing classically inspired buildings, the ancient world formed a fundamental component of the revolutionary generation’s toolbox of resistance. A Roman denarius of Publius Porcius Laeca. 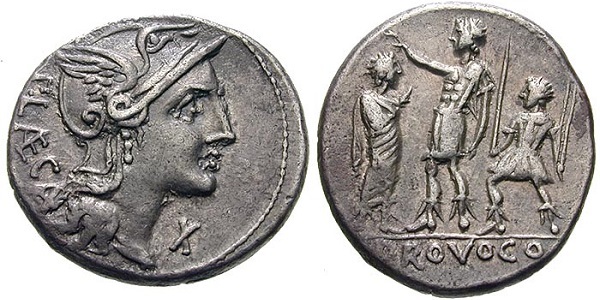 The reverse shows a bare-chested male attended by a lictor (demostrating his rank and authority). He holds his right hand over the head of a toga-wearing male figure. The text reads – provoco. Image courtesy Classical Numismatic Group. These allusions to the classical past were not taken lightly by the American revolutionary generation. Thomas Jefferson, in a letter to Benjamin Rush, once expressed fear concerning Alexander Hamilton’s ‘political principles’ and belief ‘in the necessity of…force…to govern men’ after Hamilton simply remarked that his favourite Roman was Julius Caesar. Unfortunately, despite the large crowds in attendance, it is difficult to piece together the exact content of Dr Warren’s oration in Boston that day. Some sources attest to an unsuccessful plot by the British troops present to arrest Warren and the other revolutionary leaders that were in attendance. It is alleged that this plot only failed because the agreed upon signal to arrest Warren, the pelting of him with eggs by a British ensign concealed within the audience, was unable to be given, on account of the ensign having tripped on his way to the meeting and broken the eggs. Some sources also claim that the meeting ended in disarray after Samuel Adams congratulated Warren on his speech by referring to the massacre of five years prior as being ‘bloody,’ a term that upset the sensibilities of some of the British officers in attendance and prompted them to express their displeasure with that most British of expletives, ‘Fie!’, a word which some of those in the audience mistook for the command ‘Fire!’. Perhaps sensibly, they promptly left. Despite these uncertainties concerning the precise nature of what occurred on 6 March 1775, Warren’s decision to adopt Roman garb for the commemoration of this event reveals that for dissident Americans the past was not simply a subject of academic interest, but rather served as a medium through which to understand their own circumstances and express their own beliefs. For those Bostonians gathered in the Old South Meeting House that day, as with other such cases across the continent, the classical past was very much alive. Sadly, Dr Warren would not himself remain alive much longer. He was killed by a musket ball to the head at the battle of Bunker Hill in June of the same year. His death was immortalised in The Death of General Warren at the Battle of Bunker’s Hill, June 17, 1775 by artist John Trumbull. 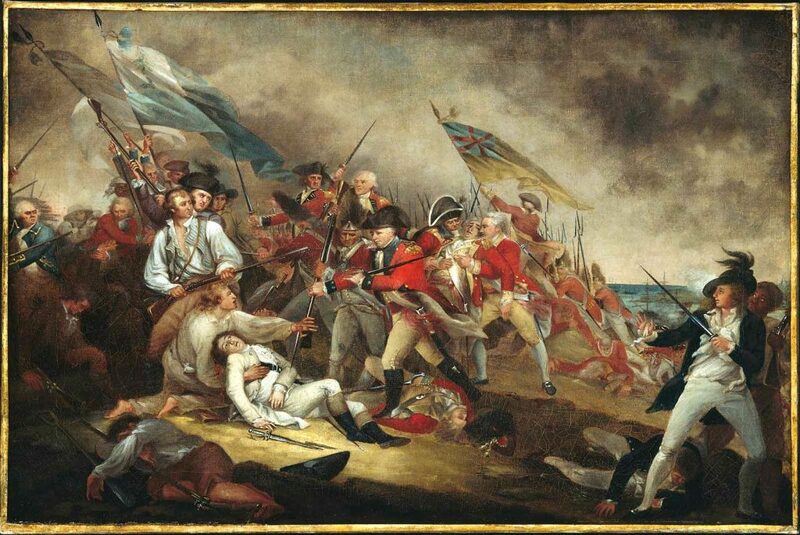 The Death of General Warren at the Battle of Bunker’s Hill, June 17, 1775 by John Trumbull. This blog, led by Will Leveritt, commemorates historical anniversaries from the Greek and Roman world through posts written by postgraduate and undergraduate students from the University of Nottingham. Each event is accompanied by a photograph of an authentic ancient coin taken by the blogging team using equipment from the University's Digital Humanities Centre. On this day in AD 31 the Praetorian Prefect Sejanus was executed.